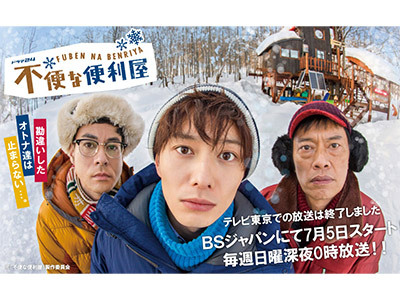 The handymen in an obscure Hokkaido town shut out by the snow are the meddlesome owner Matsui Hideo, the thrice divorced Umemoto Soichi, and the young budding scriptwriter Takeyama Jun who has lost his way. Takeyama had left Tokyo in disgust after an argument with the director on the set over liberties taken with a scene that he had put all his feelings into. He intended to go to Furano where a leading scriptwriter, who dropped out of a drama series midway, lives. However, the bus service has been brought to a standstill by the snowstorm. Takeyama stopped by at a pub in order to fill his stomach. He found himself caught in a great misunderstanding, got drunk and lost both his wallet and mobile phone. Now he has no choice but to stay in this town. So funny! One of the best collections of oddball, off the wall characters ever in one drama. It does get more serious the last two episodes but that did not take away from the overall drama at all.